This is a fun video. I used to be a big fan of the Hidden Cameras, probably up until they cancelled their show at the Grog Shop back in 2006. But I guess it wasn't their fault. They are Canadian. They have a new album out, but haven't given it much time yet. I should. !! OMG, unplugged backstage: The Hidden Cameras !! Zack from The New Gay ran into the Hidden Cameras backstage at Washington DC venue the Rock N Roll Hotel last Saturday and convinced them to perform an impromptu rendition of their 2004 anthem "Ban Marriage," in honor of the disappointing decision in Maine overturning the samesex marriage law. I haven't thought much about HD radio, but this gets me thinking. Third time’s a portable charm — at least, that’s what iBiquity Digital, the company behind HD Radio technology, is hoping with its new app. The first portable HD Radio device hit shelves through Best Buy’s Insignia brand in July, followed by the launch of Microsoft’s Zune HD in September. At the time there were no HD Radio options for Apple’s iPhone or iPod touch. This isn't really making the headlines, but Low Power FM is making it's way to the Senate tomorrow... I hope it passes. These days, there are seemingly endless options for entertainment and information at our fingertips. But how much of it is local or independent? There’s the internet, sure, but it’s not really designed to serve local communities. That’s where good old-fashioned terrestrial radio can fill a crucial void. Unfortunately, due to massive consolidation in commercial station ownership, much of what you hear on your hometown dial is pretty much what you’d hear anywhere in the country: playlists are narrow and homogenized and even the best indie and local acts have almost no chance of reaching the public airwaves. In the latest issue of Billboard Magazine, reporter Cortney Harding looks at what LPFM in more communities would mean for artists — particularly the independent variety. Harding talked to some of our favorite musicians, including Nicole Atkins, Erin McKeown and Indigo Girls, as well as Representative Mike Doyle, who co-introduced the Local Community Radio Act of 2009 in the House of Representatives. The article also features a couple of choice quotes from FMC’s very own Policy Director, Michael Bracy. McKeown and others who say they owe their careers to small, noncommercial stations are celebrating a recent victory. On Oct. 15, the U.S. House Energy and Commerce Committee passed the Local Community Radio Act of 2009, which eases requirements on channel separation between low-power and full-power FM stations, paving the way for more LP FMs to appear on the radio dial. The legislation will now go before the House of Representatives for a full floor vote. . .
Local community support is especially important for indie musicians, who have fought without much success for airplay on commercial stations. Hmm... Found this on Boing Boing. I couldn't help but be intrigued... Turns out I like the song. I also kinda like Dave Hill too (after discovering he's also a comedian and checking out some of the clips on his website). But truth be told, the video is the best of all. Thanks to the Cleveland Bachelor for this one! 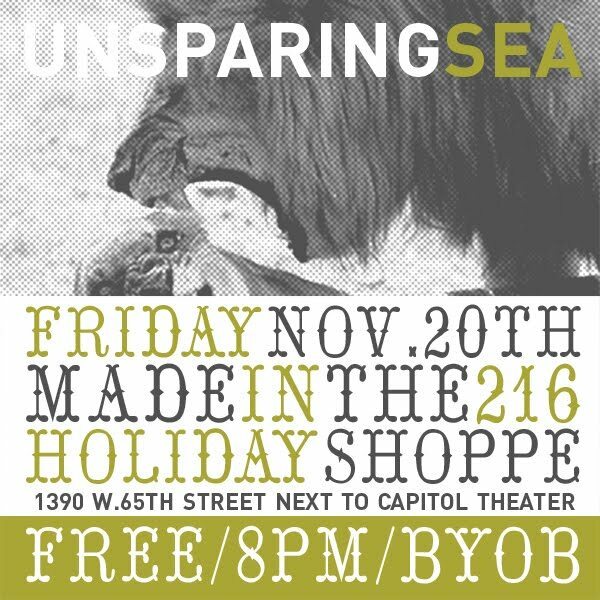 I unfortunately missed Unsparing Sea's opening performance at Edward Sharpe (and may have to miss this one). But you should definitely get out and enjoy the redeveloping Detroit Shoreway and this Made in the 216 event. Their new album comes out on Nov. 24th, and you can download a couple free tracks from it here. Congrats on your AllMusic Blog Review. Kent was definitely hoppin' last night... 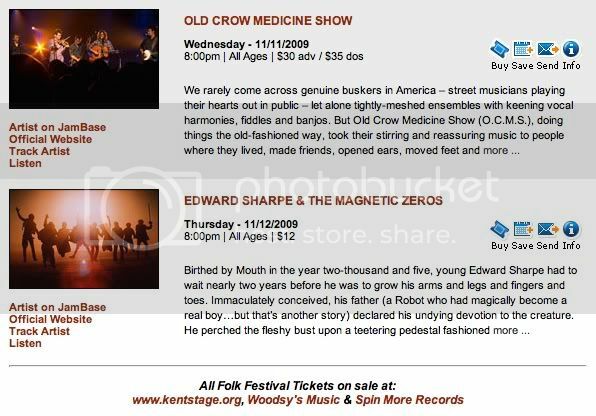 It was a sold out, exhuberant crown last night at Kent Stage for the Old Crow Medicine Show. Unfortunately, in the haste to get to Kent after work, and then to dinner and then to the Stage, I forgot my camera. So only an iPhone pic this time... which is unfortunate because were were up pretty close. Also unfortunate was my level of excitement at this show. I saw these guys back in 2005 and it was phenomenal...For this performance, tix were $30, they had a full merch table with overpriced stuff (t-shirts $25! ), which just puts a sour taste in my mouth. If I'm seeing a bluegrass show, I want it to be rustic and a little more organic... not a marketing machine. And a lot of the performance felt pretty gimmicky, like it's the same routine each city with only a change of the cities being called out. They still sounded great, and it was definitely high energy. I just had really high expectations for them. I should applaud their success I guess. Tonight is Edward Sharpe & the Magnetic Zeros!! I like the new Lady Gaga. I would not say that I'm a fan by any means. I think there's better out there, but I also think there's worse... So the internets have been flooded with her new video for Bad Romance. At first I was just going to avoid it altogether, but figured I'd give in and see what the kids were up to these days. I have to say that I was a little taken aback. I liked it! I liked the song. I also liked the video. It is ridiculous, but I couldn't turn away. I say it's a win. Has me curious what this new album will bring. If you haven't seen any of the Ice Cream Man's stuff prior, check him out... (esp. 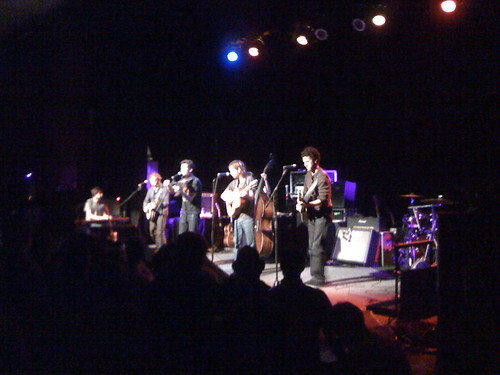 the Deer Tick / Joe Pug episode). He's pretty entertaining. The museum closes at 9 p.m. on Fridays … or does it? Performance art, an electro-squiggle band, and student art are just a few of the things you’ll be able to find this Friday at the Cleveland Museum of Art’s special After Hours party. We’re keeping the museum open extra late from 9 p.m. to 1 a.m. and we’re inviting you to stop by and help us keep the party going all night. To keep you entertained we’ve invited some very unique performers. At 9:30 p.m. New York based composer and artist Marina Rosenfeld will be showcasing her performance art creation the Sheer Frost Orchestra. This one-of-a-kind musical group is executed by 17 mostly female performers who play floor-bound guitars with nail polish bottles. Curiouser and curiouser. The performance should be good considering Rosenfeld’s list of credentials. Just when you think it won’t get any stranger that’s when the San Francisco based electro-squiggle duo Eats Tapes (Marijke Jorritsma and Gregory Zifcak) takes the stage. They perform at 11:30 p.m. just outside the Gauguin exhibition. Eats Tapes uses hardware sequencers, synths, modified drum machines, cassette players and a midi Nintendo to achieve a psychedelic, art rock sound that is guaranteed to make you want to get up and dance. 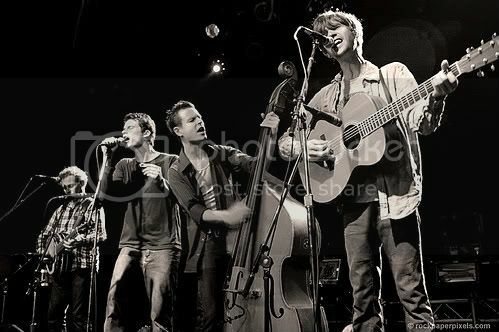 Old Crow Medicine Show is Tomorrow Night! At first listen, Old Crow Medicine Show could be one of those backwoods combos that would sometimes venture out of the sticks near Mayberry on “The Andy Griffith Show.” Heck, there’s even a guy named Critter. For all the band’s vintage trappings, there’s an energy and attitude that is borderline punk rock. And Old Crow’s lyrics, often tongue-in-cheek, regularly celebrate extreme living. Old Crow Medicine Show will appear in concert at 8 p.m. Wednesday at the Kent Stage as part of the 43rd Kent State Folk Festival. Tickets, $30, are available at www.kentstage.org. Secor, who sings and plays fiddle, harmonica and banjo, talked about the band in a recent telephone interview from his Nashville home. Q. How does your live show compare to your records? A. The live show is real high-energy, and we put a lot of passion into what we do. Acoustic music sounds best on the stage, and there’s a whole visual component to delivering it. It’s a very physical event playing violin the way I play it. Playing banjo the old-time way means you have to beat on it. When you play this kind of music, you’ve got a whole wave of history you’re dragging onstage with you. Q. Your music sounds very traditional, but then there are these lyrics about meth, coke, weed and assorted wildness. I imagine that surprises some people. A. There were some festivals we played when we were coming up where there were some great conservative elements and a lot of gospel music, and we sort of learned to tailor our show for those venues. But, you know, there’s always been a mischievous element to this kind of music. They called it the devil’s music for good reason. That song, “Cocaine Habit,” that we do is 85 years old. People like us because we’re outside the box — and you can sing along to it. Q. The lyrics of your songs are terrific, so vivid and often funny. A. Thank you. We learned a lot about songwriting from Gillian Welch, who has an uncanny knack for storytelling. The thing is, you’ve just got to keep writing songs, even though the great ones might have all been written. Melissa Etheridge had a simple message when she met with producer John Shanks to discuss her next album. “I told him that I wanted to make a record that’s a hundred miles an hour all the time — unabashedly drawing from my all of my influences,” she says. “What we’ve done rocks harder than I’ve rocked in years. There’s a couple of ballads on it, but the majority of it is just really slamming.” The disc — Fearless Love — is due in March, with the debut single (also called “Fearless Love”) coming out in January. Having a huge iTunes library is great... what's not great is having to select what I take with me on my iPhone. There are definitely ways to stream my iTunes library to my iPhone, but that typically requires that I have my home computer connected to the internet (not always possible when it's a laptop). I've also had a friend tell me about Lala lately, which sounds decent, but nothing has really sparked interest with me until I read the article below about Lala streaming your library to your iPhone via their new iPhone app. If Lala can pull this off and do it well, this will be a very tempting service. I'm still not a fan of "renting" music, which is essentially what you do when you "buy" a 10¢ web-only track from Lala, but that may change. And of course they're also more appealing (and probably more stable) because of the additional exposure because of Google. Hey, kids! Wanna stream your iTunes library to your iPhone? Lala’s got your app. Music service Lala showed off its yet-to-be-approved iPhone app, giving users the ability to listen to songs almost instantly and not have to wait for time-consuming downloads. The idea is simple. Assuming you already own the tracks in your iTunes library, Lala places copies in your digital locker for streaming to your iPhone. Each track you stream comes with a one-time-only charge of 10 cents, after which, you can stream the tunes ‘til the cows come home. Like Rhapsody’s iPhone app, users are streaming the music from “the clouds.” Unlike Rhapsody, the Lala app identifies the tracks a user listens to most and then stores those songs on the person’s iPhone to allow listening when data connections are weak or nonexistent. The Associated Press reports it takes about two seconds for songs streaming from Lala to play on iPhones, considerably less time than the two minutes or more it takes for music downloads to land on mobile devices. There is a catch. Lala is streaming as little as 32 kilobits per second – not quite the same quality as the 256 kbps tunes sold on iTunes and found on most music files already stored on mobile devices. But Nguyen says streaming bitrates will improve as cell phone data networks become stronger. ...and while writing this article I noticed Lala's embed options, offering to embed the entire track (very important). I went back and re-posted the previous Drummer tracks from this service. I typically use Grooveshark, which has been good to me, but they didn't have Drummer and Lala did. Looks like they get another point. Drummer has won my heart and ears lately... Sort of a NE Ohio super group, but with a sound and setup all their own. The Royal Bangs opened the show, which made me really glad I was there early. They were probably the best opening band I've seen in a LONG, LONG time. You should check them out. Then Cleveland's own Other Girls performed next. 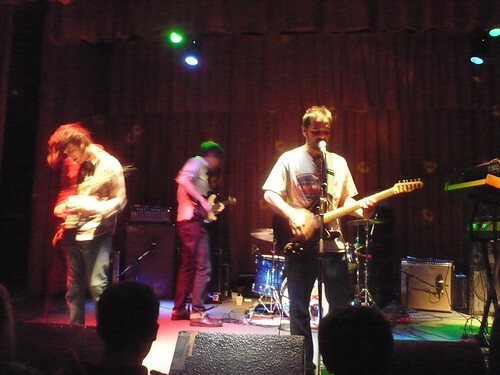 But as the lead singer from Drummer said earlier to some friends, the Royal Bangs one of *the* hardest bands to follow. Regardless, Other Girls were good. Drummer took the stage and had an amazing performance... Casual and loose, but friendly and still rockin'. I've really been struggling with how to describe them lately, and that's not really changing here and now. I'm just going to provide some sights and songs for you to experience for yourself. Here are my 3 current favorite tracks. Kent State Folk Festival Begins Tonight! I'll be going two nights in a row, and specifically taking a day off to stay in Kent to recuperate and prep for the second night. Aww yeah. Here's what I'm attending. 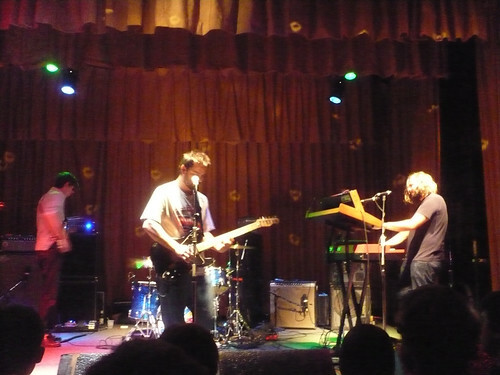 If you haven't seen this fan-made video for Grizzly Bear's "Two Weeks" you should... If you have, watch it again. A new British independent poll conducted by Ipsos Mori concluded that the people who do the most illegal downloading also buy the most music. This is in line with many other studies elsewhere and is easy to understand: people who are music superfans do more of everything to do with music: they see more live shows, listen to more radio, buy more CDs, buy more botlegs of live shows, buy more t-shirts, talk about music more, do more downloading -- all of it. And of course, these are the people the music industry's supergeniuses have set their sights upon for bizarre enforcement regimes like the one that British Business Secretary Peter Mandelson has promised: anyone who lives in a house that generates three or more copyright infringement notices will be barred from Internet access.